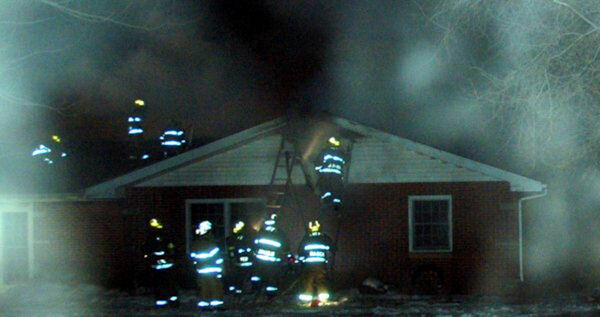 The La Harpe Fire Department was called to the Ron and Jeri Bennett home in Terre Haute shortly before 6:00 p.m. after a fire started and blazed out of control in an attached garage Sunday evening. According to Fire Chief Jerry Brown, most were home due to the freezing weather and that it was Sunday and firemen responded in a matter of minutes. Firemen came from La Harpe, Terre Haute, and Fountain Green and the MST Fire Department responded on an assist call to help stop the raging fire before it consumed the attached home. Thirty-five to forty firefighters worked together until 10:00 p.m. before the fire was contained and then worked until after midnight cleaning up equipment. Brown said that a washer and dryer was in the garage area where the fire began, and that a plywood attic roof which had been put in years ago by previous owners, quickly burnt through sending the fire into the insulation and rafters of the garage and into the rafters above the house. According to Brown, Bud Painter of Terre Haute said that when he had heard the scanner report the fire at Bennetts' home, he had looked out and saw flames shooting through their garage roof. The fire was moving too fast and too far ahead of us. We were in hopes to save the house, Bennett said, but he was not sure how much could be recovered. The garage and the rafters through the house make it pretty much unlivable, but he said he didn't think they lost any clothes or items inside the home due to fire. "Most of the damage in the home is from smoke, water, and heat. I am not sure what they can salvage from all of that," Brown said. Brown was very pleased that the Bennetts and their 7th grade son were able to get out safely and that none of the firemen were hurt with the cold, slick conditions. "It was quite a struggle with the ice and snow and freezing conditions." Bennett said they had no problem with water freezing up during the evening. A fire truck in Terre Haute didn't turn over immediately when they went to start it due to the extreme coldness, but Brown said it wasn't a problem. The firemen, who are trained and fast, quickly hooked it up and it started in a minute or two. Brown said he was proud of all his firemen considering the head start and the conditions they were working in. He was also very pleased with the assistance offered through the MST Fire Dept. and through K&C Enterprises Sales & Services in La Harpe. "Lenus Duffie let us bring all of our frozen hoses into his shop and lay them out and power wash them to thaw them out. It was a great help." As for the Bennetts, they are living in a trailer that Jeri's brother Brian Fox had until they can make other arrangements. "A lot of decisions will have to be made," Brown said. It wasn't sure how the fire started, but thought they were dealing with frozen pipes. 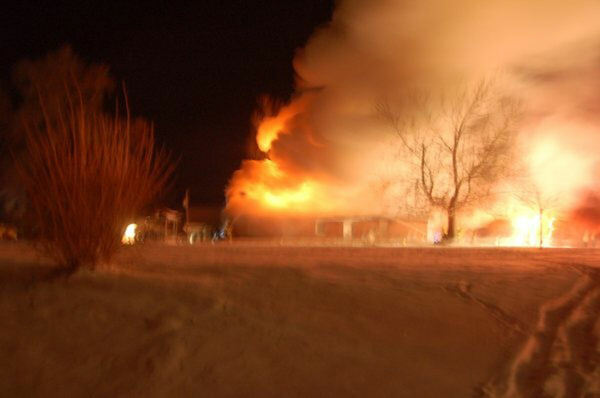 A fire Sunday evening at the Ron & Jeri Bennett home in Terre Haute brought 35-40 fire fighters out in below zero weather to rescue what they could of an already out-of-control fire. The garage was destroyed and the rafters across the house were destroyed by fire and the living quarters damaged by heat, smoke, and water.